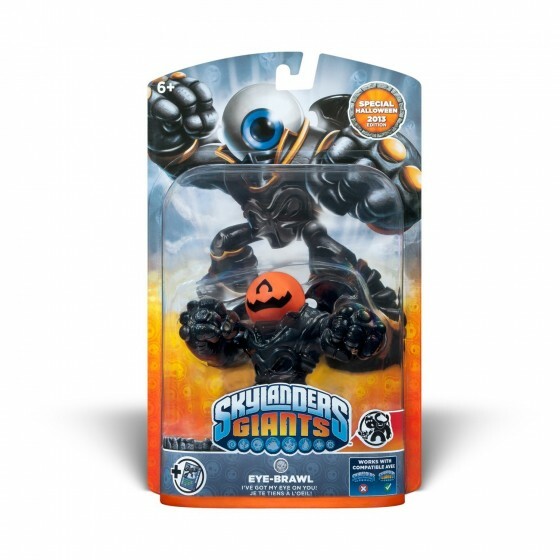 Sainsbury’s has bagged an exclusive Skylander – the ‘Halloween 2013’ edition Eye-brawl. It’s available in-store now for £14.99 – the standard RRP for a Skylanders Giants figure. Usually retailer-exclusive edition Skylanders have a simple alternative colour scheme or have been moulded out of glow-in-the-dark plastic. What sets this one apart from the rest is that Eye-brawl’s rather hard to overlook giant eye has been replaced with a bright orange pumpkin. It’s a shame that Eye-brawl’s torso is missing the original’s gold decor, resulting in this limited edition looking slightly less luxurious than it could have done. Still, all that’s required to give this figure an awesome custom paintjob is a bottle of Tipp-ex. That and a steady hand, of course.